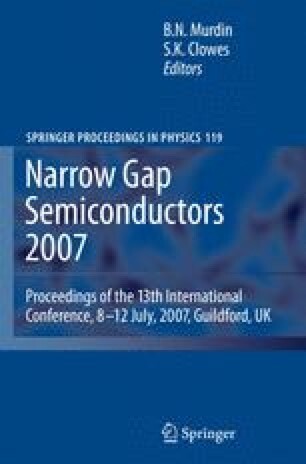 The addition of a small percentage of nitrogen to GaSb or InSb is predicted to move their response wavelengths into the long wavelength IR range due to the influence of band-gap bowing. We report the growth of GaNxSb1−x and InNxSb1−x by MBE, using an r.f. plasma nitrogen source. We demonstrate high structural quality, as determined by XRD, and FTIR absorption measurements show a shift in the cut-off wavelength to over 3 μm for GaNSb and over 11 μm for InNSb, allowing for the effect of Moss-Burstein band filling.